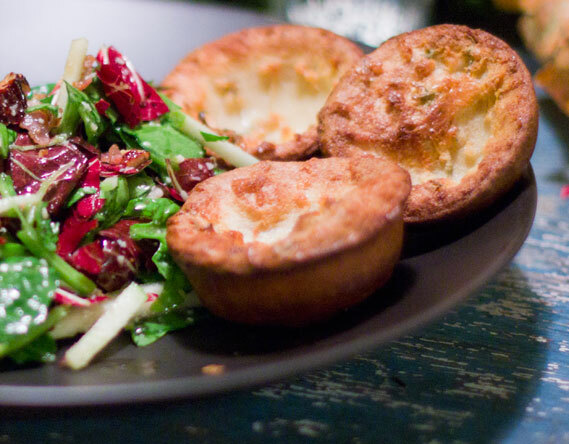 This popover recipe is a must for any gluten deprived individual. I was apprehensive to try it because my previous experiments baking light buttery puffs resulted in a a squeaky, crumbly mouthful of gluten free dust. Since my humble beginnings, I’ve gotten pretty good at the baking the basics from scratch; i.e. pancakes, cookies, and bread- but these popover rolls are a true feat, and possibly one of the easiest, tastiest baked goods I’ve created. Here is Mark Bittman’s recipe, made gluten-free! 1 cup gluten free flour ( I used 2/3 cup brown rice flour, and filled the rest of the cup with a little bob’s red mill GF all purpose flour, sorghum flour, and GF oat flour). Preheat oven to 425. Pour about 1 teaspoon of melted butter into each cup of a muffin tin (12 cup muffin tin). Place muffin tin in hot oven while prepping the batter (for about 2 minutes or so). To make the batter, whisk the eggs and milk together, then add the sugar, salt and tablespoon of melted butter and mix. Slowly add the cup of flour to the mixture and whisk until smooth, then mix in the thyme. Texture should be smooth and a little thinner than pancake batter. 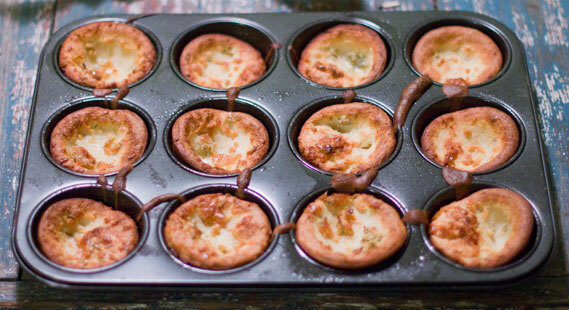 Carefully remove the muffin tin from the oven, and then quickly fill each cup half way with the batter. Bake immediatley in preheated oven for 15 minutes, then reduce temperature to 350 and bake for an additional 15 minutes. His recipe discourages you from peeking at them while they cook. The popovers should bake unchecked for 30 minutes. Serve immediately.